FOR THE BETTER part of the past four decades, the office in charge of assessing and collecting property taxes in Chicago has been firmly in the grip of the city’s Democratic machine. The process the party has set up is a boon for tax lawyers, who then give heavily to the party. The result is a system that goes light on big businesses and the wealthy while putting a disproportionate share of the burden on the city’s black and brown residents. This year, the machine is under assault. 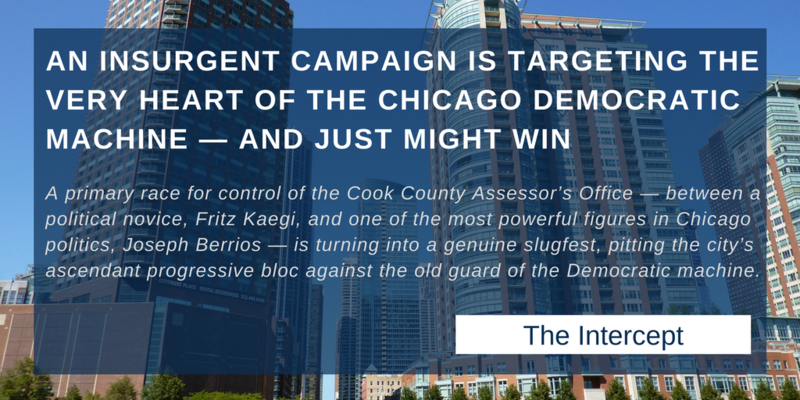 A primary race for control of the Cook County Assessor’s Office — between a political novice, Fritz Kaegi, and one of the most powerful figures in Chicago politics, Joseph Berrios — is turning into a genuine slugfest, pitting the city’s ascendant progressive bloc against the old guard of the Democratic machine. The primary will be held on Tuesday, March 20.